The parathyroid glands are small, flattened, oval glands that secrete parathyroid hormone, the major hormone that controls serum calcium regulation in the body. Usually they constitute four glands, two on each side of the thyroid gland. Some people have only two glands, while others may have up to six.Each gland normally weighs 30 to 40 mg. Because of their small size they are at risk of being accidentally removed or traumatized during surgical removal of the thyroid gland. The upper parathyroid glands are usually found adjacent to the posterior surface of the middle part of the thyroid lobe, just anterior to the recurrent laryngeal nerve. 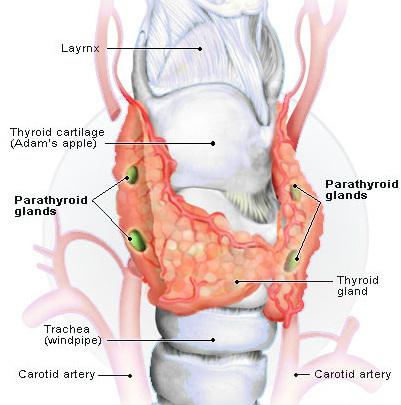 The lower parathyroid glands are found on the lateral or posterior surface of the lower part of the thyroid gland, or within several centimetres of the lower thyroid pole. Parathyroid glands viewing from the front. Blood supply to the parathyroid glands usually derives from the inferior thyroid artery. However, they may also be supplied by the superior thyroid artery or the thyroid ima artery. Parathyroid veins drain into the thyroid venous plexus. 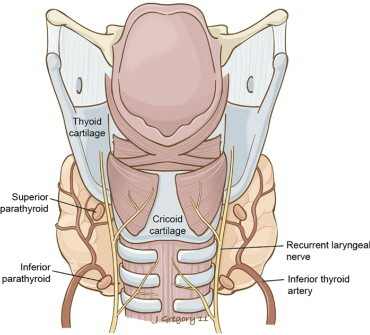 Lymphatic vessels drain into the lymphatic vessels of the thyroid gland, and to cervical and paratracheal lymph nodes. Parathyroid glands viewing from the back. The thyroid gland cells also produce a hormone called calcitonin. It works with parathyroid hormone, which is made by the parathyroid glands. 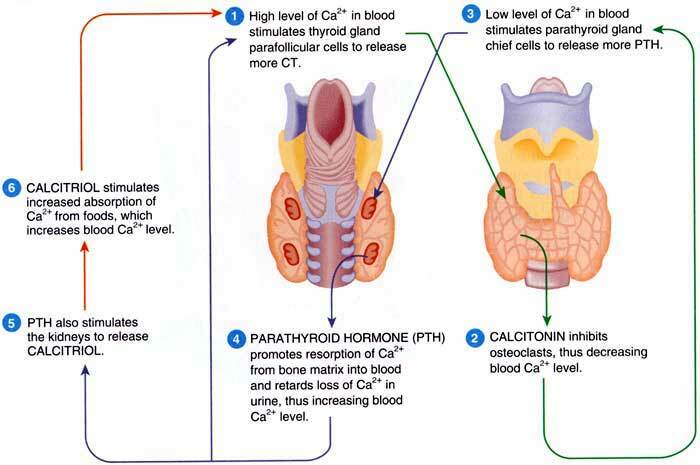 Calcitonin and parathyroid hormone control the amount of calcium circulating in the blood. Calcitonin tends to lower calcium levels in the blood by encouraging the bones to store calcium and the kidneys to get rid of it in the urine. Parathyroid hormone encourages the bones to release calcium into the bloodstream and the kidneys to take it back before it is lost in the urine. Calcium is important for the nervous system. Too much calcium can cause nausea and drowsiness. Too little calcium can cause problems with the nerves, such as pins and needles, as well as twitching and jerking of the muscles.